Notification of the passing of Lorraine ‘Larry’ Evonne Muto, widow of NWA Capt. Herman P. Muto. Larry was 89 years of age at the time of her passing March 6th. Services will be held at St. Francis of Assisi Catholic Church in Burien WA, at 1 PM on Saturday March 23rd. Larry’s husband Captain Herman Paul Muto hired on with Northwest 07-01-1944 and retired 06-04-1973. Lorraine Evonne Booth and Herman Paul Muto were married June 5, 1943 in Spokane county, Washington state. 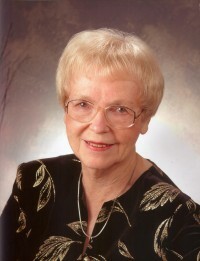 Lorraine Muto (known as Larry to family and friends), 89, passed away Wednesday, March 6, 2013. Larry was born on her family’s farm in Nezperce, Idaho, where she lived with her parents, Lella and Herbert Booth, and her older brother, Don. She lived in Kamiah and then Kellogg, Idaho, graduating from Kellogg High School in 1940. Larry attended Northwestern Business College in Spokane, Washington, and met Herman Muto at her first job as office cashier for Greenough’s Grocery Store. Larry and Herman were married in 1943 and moved first to Portland, Oregon, then to Seattle for Herman’s job as a pilot for Northwest Airlines. They built a home in Normandy Park in 1954 and raised their family among a wonderful group of neighbors who became good friends. Larry was an active member of the community. She helped organize neighborhood salmon bakes at the Cove, was a Camp Fire group leader for three of her daughters, and held leadership positions in Camp Fire’s Central Puget Sound Council, including coordinating candy sales (which meant that her freezer was always full of Camp Fire mints!). She has been a member of “The Sprouts,” a Washington Park Arboretum Garden Club, since 1955. Larry went back to work at age 50 at the Highline Community College bookstore. During her 11 years at the bookstore, her co-workers became another group of lifelong friends. Each new activity after retirement, including yoga and swimming, brought a new group of friends. Larry and Herman were also active members of the Retired Northwest Pilot’s Association (RNPA) and together they published the RNPA Newsletter for 18 years. Family and friends were Larry’s priorities and she will be dearly missed by her children, Donna Cummings (Jim), Paul Muto (Myrna), Marilyn Hovey (Mike), Marcia Muto Flynn (Jim), and Sheila Millman (Ed); 13 grandchildren; 8 grandchildren-in-law; 10 great-grandchildren; and many other relatives and friends. Larry was preceded in death by her brother, Don, and her husband of 57 years, Herman Muto. Services will be held at St. Francis of Assisi Catholic Church in Burien at 1 p.m. on Saturday, March 23, 2013. A favorite charity was the Washington Park Arboretum in Seattle. .Published in The Seattle Times on March 17, 2013.